One of our newest authorized Glidecoat Dealers in Colorado, Tim Sims at Lost in Time LLC, completed a restoration of his own boat with the help of Glidecoat’s Liquid Crystal. 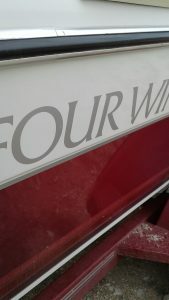 Tim is the owner of a 1992 Four Winns, with a red and white hull. 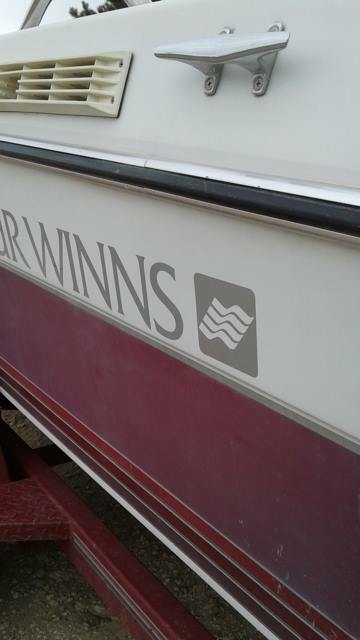 In 1992, when this boat was brand new, it looked amazing! Naturally over the course of 25 years, this two-toned hull lost its original luster, giving the boat a dull, faded look. This is a problem that every owner of an aging boat has experienced, and standard wax products will not solve this problem. Glidecoat Liquid Crystal is the perfect product to help restore the gloss and shine of older boats, bringing back that show room finish! Utilizing Glidecoat’s Nano Technology, the Liquid Crystal can fill in the pours of old gel coat, creating a smooth hydrophobic surface, while also restoring the original color of the hull. Once cured, Glidecoat Liquid Crystal creates a diamond hard barrier, bonding with the gel coat. Before beginning the steps to restore his boat, Tim used a Gloss Meter to measure the amount of gloss and reflection of the surface. These readings averaged 26 around various areas on the hull. The boat was then washed with Glidecoat Nano Wash, which is a high foam, non-abrasive soap. 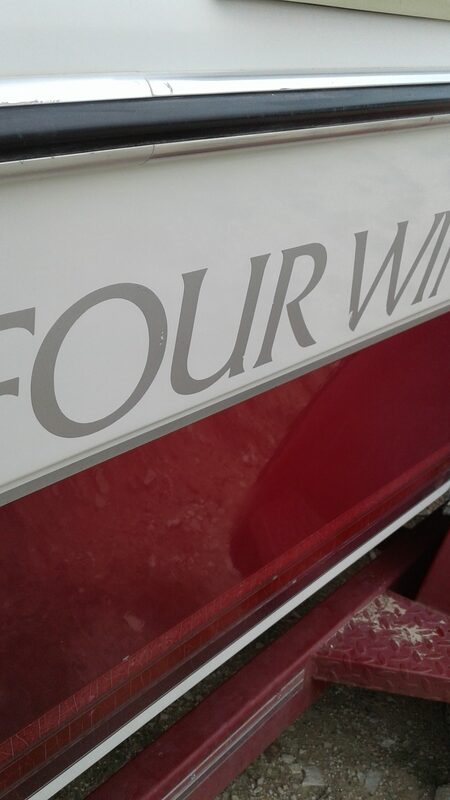 After washing, rinsing, and drying the boat, Tim began to compound the hull with Glidecoat Nano Compound – a medium cut. With the use of a dual action buffer, a medium cut foam pad, and the Glidecoat Nano Compound, the surface of the hull started to show some signs of life! After compounding the entire hull, removing oxidization and surface marks, Tim then used Glidecoat Nano Polish. With the use of a dual action buffer and a foam finishing pad, Glidecoat Nano Polish started to restore the shine of this old boat. After polishing, Glidecoat Surface Wipe was used to de-contaminate the surface, removing any leftover residue from the compound and polishing. The last and final step was the application of Glidecoat Liquid Crystal. Tim applied the Liquid Crystal to the entire hull (waterline and up) twice, allowing the product to add further shine and gloss while also sealing the surface for up to 2 years, making it hydrophobic and providing much needed UV protection. After completing all the steps and applying Glidecoat Liquid Crystal, the Gloss meter readings went from an average of 26 all the way up to an average reading of 88, which is equivalent to factory new gel coat.